As the oldest cities in Thailand, there are more and more travelers visit Lamphun for its heritage buildings, temples, architecture, crafts, and other sight-seeing. Lamphun is also one of the most important industrial estates where there are more than 500 factories housing more than 100,000 foreigners, executives, and workers. 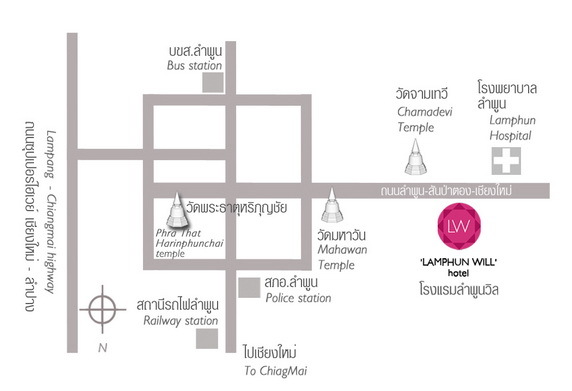 Our LAMPHUN WILL HOTEL will be the most important meeting center of not only Lamphun but also the Northern part of Thailand. We provide relaxing and efficient facilities and services to make our guests\' meetings and social functions successful every time. Personal touch to each function is carefully planned. Our sales representatives are experienced in assisting your event very successful and memorable. Your wish list is our responsibilities and each member of staff is pleased to provide his or her very best services and welcome your comments to make your meeting and events better.